Yesterday, we ran the first part of my conversation with some of the architects of moveDC, the new long-range plan from the District Department of Transportation. MoveDC calls for the implementation of congestion pricing, 69 miles of high-capacity transit in addition to the 22 miles of streetcar already planned, a new downtown Metro loop, 72 miles of protected bike lanes, 136 miles of painted bike lanes, and 135 miles of off-street trails over the next 25 years. In yesterday’s installment, I talked to Matt Brown, DDOT’s new acting director; Colleen Hawkinson, strategic planning branch manager at DDOT’s Policy, Planning and Sustainability Administration (PPSA); and Sam Zimbabwe, associate director of the PPSA, about the prospects for the most dramatic changes envisioned in the plan, the pitfalls of a focus on Complete Streets, and the reality that cars will not win every tradeoff anymore. Here we pick up where we left off. In the plan, there are two side-by-side maps (above) of future road congestion: with the changes laid out in the plan and without. And they’re very similar. Not identical, but very similar. SZ: They’re not identical. But you have to remember, this removes a lot of vehicular capacity in exchange for some other things. So in order to create the space to provide more options, there was a need to manage the person-carrying capacity of the roadway system. And there were two principles that went along with that. One is that there’s always a way to not pay the charge. The way we modeled it, it’s roughly equivalent to a round trip metro fare. I thought that was interesting, to basically say you’re not going to pay any more to drive than to take the metro. SZ: And carpools might be free. But everybody’s paying. District residents have to pay. And as we look at the whole system, we’re accommodating the same number of car trips in a day in 2040 as we are today, even as the District grows by 170,000 residents and a couple hundred thousand jobs. CH: And we could have made these colors [on the map] pretty much whatever we wanted to. If we add more roads that would be tolled, like Massachusetts Avenue and Connecticut Avenue, we could get different colors in here. But it didn’t seem like we needed that to keep the network moving. This seemed to be a sweet spot in terms of the size of the cordon charge. SZ: In the region, we’re starting to get experience with tolls. People ride the ICC [which is tolled and free-flowing]; they take 495 [which is free and congested]. They start to see what that means. I’m curious about the technical aspect of it — if you have that worked out. SZ: The Virginia side is. …But not if someone’s coming in on 10th Street. Is it all electronic license plate monitors? SZ: We don’t know. We tried to [include congestion pricing] to model the future, but we haven’t tried to figure out all the details yet. I think it’s more like a London system than a bridge entry. They have closed-circuit TVs to read every license plate. But we also continue to look at managing the highway facilities and think about how that would be integrated. So it’s not all or nothing. How much were the Metropolitan Washington Council of Governments and the Office of Planning involved in this process? SZ: We had an agency advisory committee — this doesn’t mean endorsement by them, but they were engaged in the process. The Office of Planning more than anybody. District agencies, COG, VDOT and MDOT were on that advisory committee. And Colleen presented the plan to the full Transportation Planning Board in March, as we were still writing it. And this generated some comments. What were the parts they were most skeptical about or troubled by? SZ: I think the congestion charge. CH: Exactly. But it’s really not that. The DC residents would pay the same. MB: It’s the same with freeway managed lanes. You could say the same for parking. SZ: I think people have. Oh great. People really compare it to an income tax on commuters? SZ: That’s sort of the knee-jerk response anytime we discuss pricing. But those are apples and oranges. SZ: From our perspective, providing a way to not pay the charge — walking, biking, taking Metro, taking transit, maybe carpooling — there are many ways to not pay the charge. Commuter, non-commuter — this is about managing the transportation system. So everybody was consulted with, even if they didn’t necessarily sign on. SZ: It’s not a regional plan. It’s a plan for the District. And we looked at not only the comments that other jurisdictions had about our transportation system, but also ways that our transportation system could better connect to things that they are trying to do. So we looked a lot at Montgomery County’s BRT plans and how demand from other parts of the region to connect would feed into the District’s transportation system. And a lot of our high-capacity transit corridors try to connect to Montgomery and Prince George’s County, to connect with where they’ve talked about doing higher-capacity. A lot of our trail system and bridge connections try to connect with what Virginia’s doing. So I think there’s a lot of regional coordination and collaboration around ways to connect the system. I want to ask about federal land. DC is such a special case. Is it a burden to have to deal with Congress, or to have to deal with federal roadways you can’t just redesign? Does that come up a lot? SZ: It does. It comes up in a lot of different ways, from where we’re allowed to spend our resources to, you know, you can sneeze and hit a national park around here. Yeah, every little corner pocket park is a national park in DC. SZ: Right, so we’re accustomed to the interagency collaboration. We didn’t limit ourselves to just District-controlled streets in this, and we did look at some of those links that are controlled by National Park Service or Architect of the Capitol. There aren’t that many, especially once you get outside of the historic city. MB: But there’s also CSX, there’s Amtrak, there’s WMATA — there’s any number of partners we have to work with. But I also think any number of cities across the country would want the direct relationship that DDOT has with [the] Federal Highway [Administration]. We meet with Federal Highway at least every two weeks; we work with them on our projects; we receive funds directly from them, not through a state. Sure, we have our issues, especially with the federal lands. But so I think there’s tremendous opportunity here. So it seemed kind of rough that this came out a week after the really bad news about the streetcar and that that came with this reproach from Mendelson and the City Council saying this was mismanaged. MB: Let me just say: Absolutely not. What does “absolutely not” mean? MB: It wasn’t timed. Our desire was to get this out as quickly as we can, to do it before people are gone for the summer, to finalize the plan and to document all the work that has gone into this and all those sessions we had with the community. There was no ulterior motive here. Oh, I’m saying quite the opposite. Right after the Council says, “We’re not really into giving a whole lot more money into DDOT’s big multi-modal plans,” you come out with The Big Multi-Modal Plan. That seems to set up an antagonistic relationship with the Council. How are you approaching that? SZ: I don’t think it’s antagonistic. MB: I think it’s important that we communicate what our vision is. We need to be clear about where we are going. But how will you approach a Council that has just gone on record saying, “We’re not interested in giving DDOT more money for grand multi-modal plans”? MB: Well, for a specific aspect of the 22-mile streetcar system. Which is part of this as well, plus a million other things. MB: But if you listen to [Council Chair Phil] Mendelson on his face, he’s not stopping the streetcar program. He’s criticized us for our implementation. But like I said, I think we have to be clear about our vision and we have to talk about things like managed lanes and congestion pricing and dedicated funding streams. We have to have that conversation. SZ: The funding mechanism they removed was the same funding mechanism they had approved the year before. So that, to me, is more about the tensions in a growing city and the way it was paired with tax cuts made it a difficult either/or. But this [plan] still talks about how that priority streetcar network fits within a larger transportation system and what it’s intended to do. And you feel like the Council is still open to having that conversation? SZ: We have a hearing tomorrow on a bill that tries to create an authority to make the streetcar happen faster, at the same time as they just took away funding for it. So I don’t pretend to understand exactly what’s going through their minds as they do all this. And then in terms of funding, you said you’re open to this being a menu of options, and that they might not order the whole menu. You say you have $22 billion identified for it. SZ: That’ll have to change now. But even if you got all the funding you project might possibly come in, you still don’t quite make it. So is there a sense of where that prioritization would happen? Would that happen within DDOT? Would that happen with the Council saying, “We’re going to fund this part but not this part?” Is it just obvious, that the downtown metro loop is going to be super-expensive, cordon pricing is going to be super-expensive so that’s going to be at the end of the list? MB: I think you’ve hit on one of our challenges — and the next step. Looking at all the recommendations, figuring out what is short-term, easy to implement. The more expensive items are obviously ones that require a heavier lift and more funding. We were talking about taking the plan and turning it into an action plan. I think that’s important to operationalize the elements of the plan. SZ: But we didn’t have this [long-range plan]. We haven’t done this since 1997, and then we did it again in 2004 and it got rolled in to the comprehensive plan. And this isn’t a static plan where we’re going to put it on the shelf and then in 2030 we say, “This is still the plan and we’re still going to do it.” It’s something that gets updated every five or six years. MB: And that’s not unlike the action agenda that was put together for Sustainable DC. Yes, so how does this dovetail with that? We see it as providing an overarching sustainability [framework]. In many ways it’s the perfect complement to this. We’ve talked to a couple of other cities that are starting major planning efforts that heard about this in one way or another. Portland and Seattle are both starting major transportation plans. And wanting to go in this sort of direction? SZ: Well they heard about what we were doing and they were curious about it. And we gave them some advice about what to do and what not to do. SZ: I don’t know. It was largely a very successful process. I don’t know, what do you not do? CH: That’s a good question. 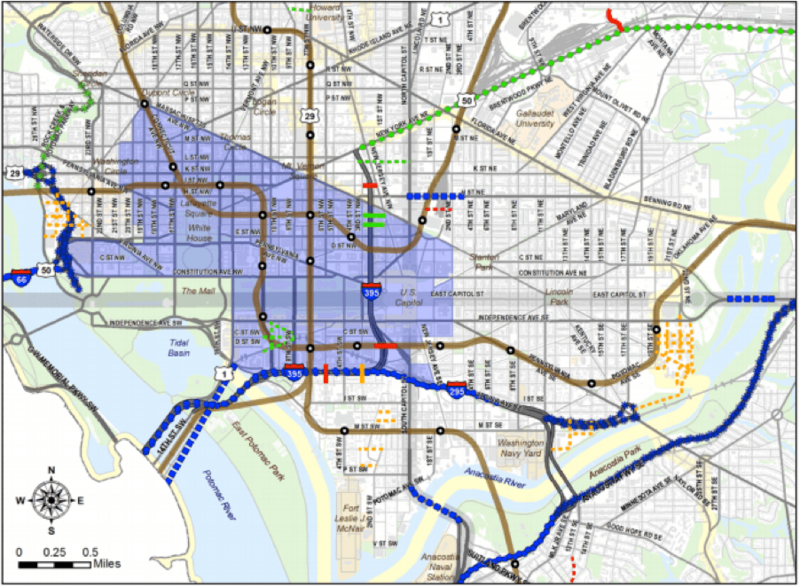 What is the goal of the DC streetcar? Better surface transit, or is it a bumblefuck way to avoid investing in rapid transit? 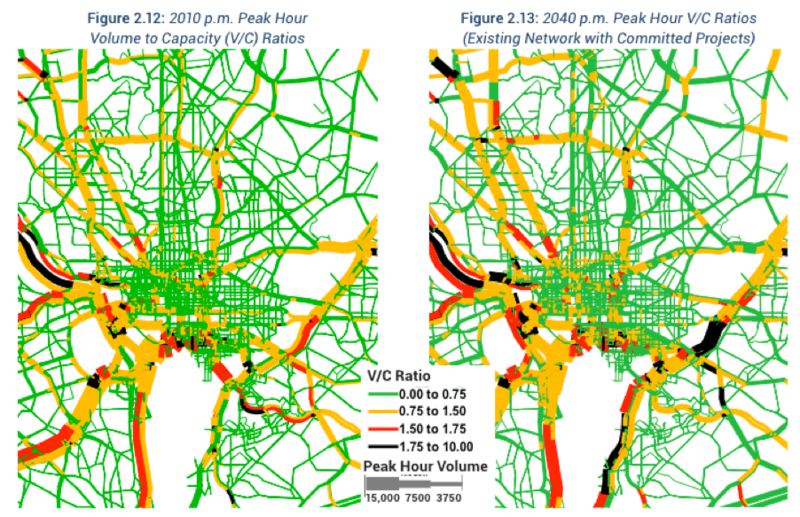 “How much does the moveDC plan relieve congestion? Not much, actually. According to the image, the left is 2010, the right is 2040 “with committed projects.” Please correct. 1. It’s nutty to devote so many resources to bicycles, since such a tiny percent of commuters use them. 2. Eliminating a regional from consideration is a very wrong assumption. WMATA, for example, needs dedicated regional funding. 3. Low-hanging fruit should be considered, such as changing DC’s many timed traffic lights to demand lights, which would reduce congestion, increase productivity, and reduce pollution. 4. Condon tolling systems have regressive economic effects on low-income people. #3 should be done wherever there are traffic lights. Timed traffic lights are stone-age dumb technology which shouldn’t exist in this day and age. Nobody should have to wait at a red light if nothing is crossing. The changes would make the system faster and more accessible while increasing capacity.